Bruno Mars has said locking himself up in the studio can get lonely. The Just The Way You Are singer, who picked up a Grammy award last week, told the Daily Mirror: "It can get a little lonely and a little dark sometimes, but the pay-off is when you get the album out and songs are playing all round the world." 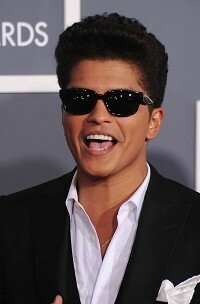 But Bruno declared he was proud of his achievements, saying: "I've worked really hard. I hope people realise all the success I've had didn't just happen in a day. It's years of locking yourself away in the studio." And the singer, who is touring the UK next month, told fans to expect a stripped-down show. "I'm holding a guitar and singing the tunes. "People might think I'm up there with a tux and an orchestra, but it's the exact opposite."